Update: For 2016 they have expanded the space for Meet The Breeds and combined the Meet The Breeds and Agility Competition into a single ticket. Friends of mine who attended the Agility competition last year really enjoyed it! With all the dog owners and dog lovers in town for the Westminster Kennel Club Dog Show, it makes sense that there should be an event where people can learn about (& even pet!) most of the over 100 different breeds of dog in town for the event -- so for the past 6 years there has been a Meet The Breeds event held in the days before the Westminster Dog Show which takes place every February in New York City. 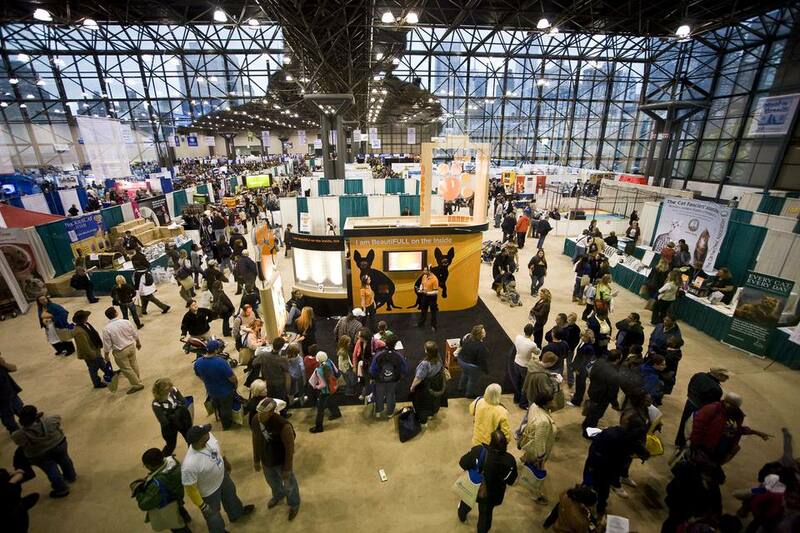 The event is held at Pier 92, along the West Side Highway at 55th Street and is basically like any other exhibition hall event you've ever been to and each of over 100 different breeds of dog has their own booth. The booths vary from very simple setups of a dog and owner to fancier displays highlighting the breed's history and heritage, but for the most part there are passionate, friendly dog owners at each booth sharing their dogs and their love (and knowledge) of a particular breed of dog. We found owners to be tremendously friendly, even after a long day of greeting the numerous visitors that attended the days event. It was a great opportunity for potential dog owners to identify breeds that would be suitable for their lifestyle. The booths are laid out in alphabetical order by breed, though there are also booths for the American Kennel Club, as well as pet insurance and other pet products interspersed among the breed-specific booths. We spent about an hour at the Meet the Breeds event, but could have spent much more time learning about and meeting the various dogs if it wasn't so crowded in the hall. Next time I attend the event, I would make sure to arrive at the beginning to maximize our enjoyment of the experience. Save money by purchasing your tickets online in advance. You can even buy them the same day and save roughly $5/adult. Arrive at the beginning of the event for several different reasons -- the line to get in will be the shortest (some folks arriving in the afternoon waited 90 minutes to get in! ), the exhibition space will be less crowded, and the dogs will be at their freshest and most friendly. If you're visiting with kids (or adults that are unfamiliar with dogs) pay attention to the "How To Greet A Dog" signs posted throughout the event. They offered step-by-step instructions on how to responsibly and safely greet unfamiliar dogs -- a good lesson for the event, as well as for meeting dogs in public. If you have a scout(or any kid, for that matter) in your family, stop by the Girl Scouts of Greater New York booth to pick up their "Responsible Dog Owner" patch activity packet. It's a nice way to focus your exploration around the exhibition hall, learn about a variety of different breeds, interact with the pet owners and learn about the responsibilities that come with pet ownership. After you've completed the packet, return to the booth with your worksheets, show that they are completed and receive your patch. And it's completely free! Event took place on Saturday, February 13, 2016 from 10 a.m. - 5 p.m.